Are you interested in discovering some of the best cross country skiing in all of Oregon? Central Oregon has multiple ski areas that serve a diverse range of cross country skiing needs. Depending on your specific desires related to the sport of cross country skiing, you will soon discover which areas are best suited for your enjoyable adventure. Central Oregon is known for its easy accessibility to outdoor adventures, and cross country skiing is one of those fantastic adventures. The ways in which you can enjoy cross country skiing are nearly limitless. Depending on what exactly you are looking for, will help you determine which cross country ski trail system will best suit your needs. Below you will discover all of the possible locations and trail systems that are available to you here in Central Oregon, and specificities, that will help you decide which is the best area for you to try first! You will find information covering Meissner Nordic, Mt. Bachcelor Nordic, Hoodoo Nordic, and Wanoga Snow Park. Located approximately 15 miles from the heart of Bend, Oregon, Meissner Nordic is located at Virginia Meisner Snow Park. Originally developed by elite cross country skiers living in Bend at the time, in 1996, Meissner Nordic was developed to mimic the local ski clubs that accompany small towns of all over Europe. Meissner Nordic is a nonprofit organization, that provides all of its grooming services, funded solely through donations from the community. Over the years, the Meissner Nordic, has turned into one of, if not the largest, mecca of pristinely groomed trail systems in all of Oregon. With up to 40 kilometers of diverse trail systems, Meissner Nordic provides terrain suitable for first time beginners, to elite Nordic ski racers striving to reach Olympic Dreams. Not only do they provide an excellent groomed trail system for cross country skiing, but they also provide a string of well marked snow shoe trails throughout the groomed trail system. Accessible by cross country skis, or snow shoes, three warming shelters can be found within the trail systems. The Nordeen Shelter, Shooting Star Shelter, and Virginia Meissner Shelter provide great views, and a place to escape the weather, if need be. Due to its donation based funding, Meissner Nordic grooms regularly Tuesday, Wednesday, and Thursday, throughout the week, and both Saturday and Sunday, on the weekends. Additionally, grooming services are provided every day of the Winter Holiday Break, and Spring Break. Specific dates of those holiday breaks are dependent on the calendar of the Bend La-Pine School District, for any given year. Specific dates, and actively updated grooming reports, can be found on the Meisner Nordic Grooming Report Page (updated every morning after grooming). Want to get off the beaten path? Meissner Nordic also provides ungroomed, yet marked, trails, that venture off the groomed trail system, allowing you enjoy the serenity of winter’s beauty even more! You will find that Meissner Nordic is a very popular attraction to cross country skiers in and out of the area. If you can’t find a parking spot on any particular day, know that just 2 miles up the Cascade Lakes Highway, Swampy Snow Park can be utilized, as access to the very same trail system, is provided from that location as well. In attempt to sustain the generously provided grooming accommodations, it is important to note that dogs are not allowed at Meissner Nordic. Keep reading on, to learn more about Wanoga Snow Park, and its dog friendly policy. After you enjoy your time out on the trails, don’t forget to feed the donation box, so we can all continue to enjoy the greatness of Meissner Nordic! With the potential for 62 kilometers of groomed cross country ski trails, as well as access to the backcountry, Mt. Bachelor Nordic Center will serve every and all of your cross country skiing pursuits. Located just 18 miles from the outskirts of Bend, Mt. Bachelor Nordic Center grooms daily, with reasonable rates for everyone. Seniors (65+) can enjoy a full day of skiing for just $14, as well as youths, ages 6-18. For the rest of us, you can enjoy a full day of cross country skiing for $21. 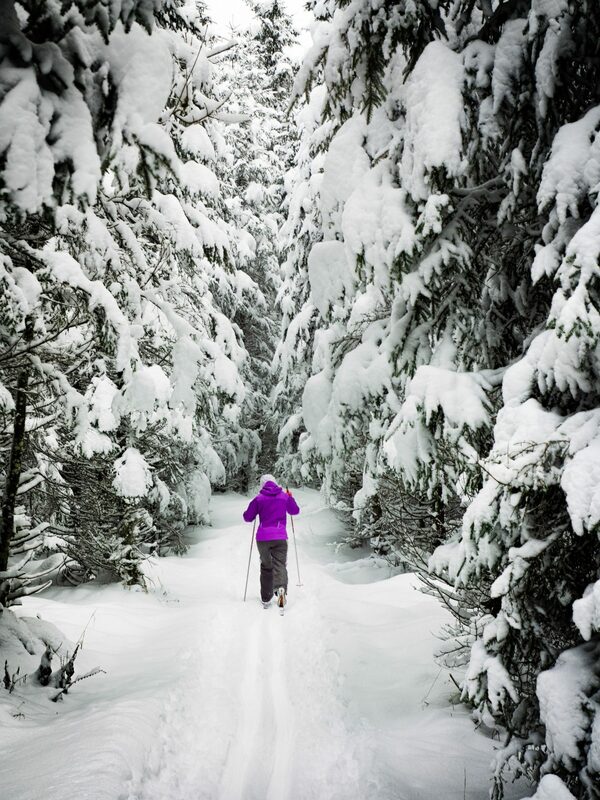 A wide variety of trails cater to any level of cross country skier out there. The upper trail system accommodates new and beginning skiers with gentle terrain, and a training oval with a breathtaking view of the Cascade Range, on a clear day. With multiple group or private lessons available, trying cross country skiing for the first time will be a pleasure with the excellent teaching staff that Mt. Bachelor employees. Head to the lower trails, and experience a diverse terrain, that flows with the natural volcanic landscape. These world renown trails attract elite local and national ski racers annually, including a spring camp, dedicated to the US Nordic Ski Team. Now, if the groomers aren’t for you, you’ve still come to the right place. Acquire a common corridor trail pass (free of charge), and you can access the backcountry trails of the Cascade Mountain Range, just a kilometer away. Explore Todd Lake, only 5 kilometers into the backcountry, or venture all the way to the base of Broken Top, utilizing snowmobile trails, or user created nordic tracks. Again, due to the resort nature of Mt. Bachelor Nordic, please note that dogs are not allowed at this ski area. Located at the top of Santiam Pass, outside of Sisters, OR, discover the diverse cross country trail systems of Hoodoo Nordic. With a total of approximately 15 kilometers of groomed trails, Hoodoo serves the needs of all cross country skiers out there. Within the lower trail system, approximately 6 kilometers of groomed trails serve the needs of new or beginner cross country skiers, and just like Mt. Bachelor, Hoodoo offers a wide variety of group or private lessons for any ability or skill level. Pricing for Seniors 65+, and Juniors 6-12, can enjoy their day of cross country skiing for only $10; $16 will provide everyone else with a day of cross country skiing at Hoodoo Nordic (Peak Pricing during holidays and events increase prices by $2 and $3 respectively). 1.5 hour group or private lessons that include a rental, can be catered to any level of cross country skier. Experienced teachers will provide the necessary coaching abilities, depending on your specific level of experience. If you’re a seasoned veteran in the sport of cross country skiing, visit the upper trail system to find nearly 9 kilometers of more diverse and technical terrain, and enjoy some incredible views of the southern and northern Cascade Mountain range, through the snow covered fire scars scattering the surrounding area. Grooming is provided on Friday, Saturday, and Sunday, throughout the winter season. Holiday Monday’s will also provide the same grooming services. Grooming is not generally provided on non holiday Tuesdays and Thursdays, but that means you can ski for FREE! Hoodoo is closed on most Wednesdays, throughout the winter season. Finally, you’ve found your dog friendly cross country skiing spot in Central Oregon! With free of charge grooming, you and your fury friend can enjoy cross country skiing in Central Oregon together. Adjacent to miles of snowmobile trails, Wanoga Snow Play Area, provides all of you cross country ski needs, and as well as multiple additional amenities for others in your group not skiing that day. Utilize the small, yet groomed, dog park loop with your pooch, or venture off on the nearly endless snowmobile trails that weave throughout the Deschutes National Forest. Keep a wary eye out for all of the snowmobilers, and make sure you have good high visibility on you and your dog/s. However, get up and out early, and you won’t encounter nearly as many motorized recreators. Again, for those folks in your party not cross country skiing with you, the nearby sled hill will, and snowshoeing opportunities, allow everyone the opportunity to enjoy the winter wonderland that visits Central Oregon, each and every year. With the only flex machine in Central Oregon, WebSkis has the ability to hand pick the most effective and efficient performance ski, in both skate and classic techniques. Located in the heart of downtown Bend, in the Old Stone Church, they are easily accessible, on your way up to the snow. Their friendly, and extremely knowledgeable staff will have no problem getting you on the right boards, so you can enjoy your cross country skiing to its full potential. With their diverse range of equipment and gear, the folks down at Web have the ability to put you in the most suited equipment, depending upon your cross country ski desires. They offer equipment in the areas of light backcountry/touring styles, all the way up to high performance, World Cup performance racing equipment. Rental equipment and snow park permits are also available at Web, and with a wide range of rental equipment, you will have no problem being outfitted with the proper equipment, for your most enjoyable experience. Locally rooted in Bend, OR since opening in their doors at their current location, in 1972, Sunnyside Sports is a local favorite. Their well versed knowledge in cross country skiing, will allow them to suit your needs, no matter what level of experience you may have, or desire. From entry level recreational cross country gear, to high performance racing equipment, Sunnyside will most definitely be able to outfit you for your particular needs. Providing rental equipment and snow park permits, Sunnyside can be your one stop shop, before your travel up to your outdoor recreation area of choice. With a deep background in backcountry touring, Pine Mountain sports is another great local shop, that will fulfill your equipment needs. Better suited for cross country enthusiasts looking for touring equipment, up to recreational level cross country skiing, Pine Mountain Sports can be your one stop shop, on the very same road that you will find access to Meissner Nordic, Wanoga Snow Park, and Mt. Bachelor. 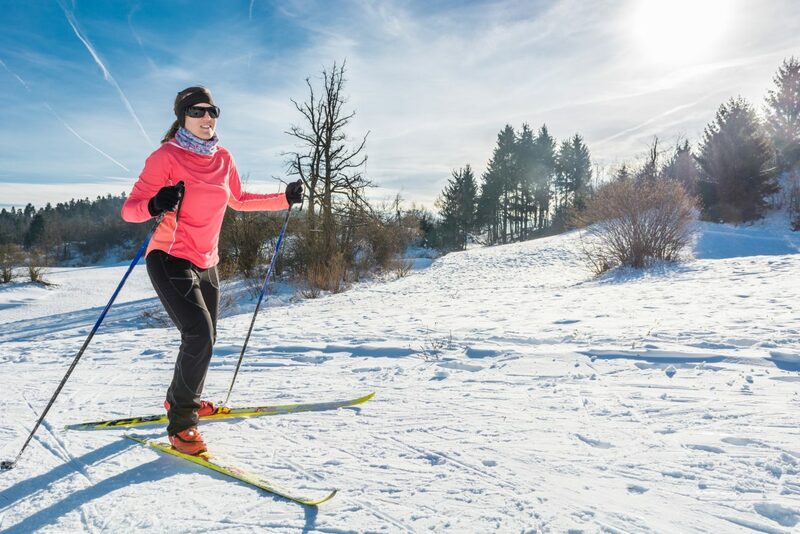 Providing both rental equipment, as well as similar products for purchase, Pine Mountain Sports will also meet your cross country skiing equipment needs. Another local shop, just across the street from Pine Mountain Sports, Powder House has a large selection of rental equipment for beginner and recreational cross country skiers. If you have a large group, Powder House has a large rental fleet of cross country ski equipment, to meet your needs. With alpine and snowboard equipment rentals available as well, it can be a great one shop stop, for your multi sport day of winter recreation enjoyment, here in Central Oregon.